A complex thriller seeped in genuine courtroom drama and high intensity action. “Murder or the attempt thereof often occurs while others sleep.” And thus begins a story where danger insinuates itself into the course of ordinary lives. Rod Cavanaugh was in fact a regular guy. Suited for his job as a criminal lawyer, he adores his girls and loves his scotch. 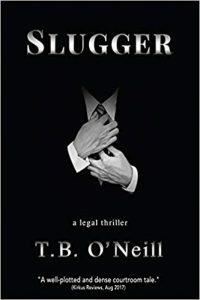 When the bottom fell out of his marriage and his family splintered he thought he had enough to deal with – mistakes of his doing that needed to be corrected – but that was before he became the target of a client, in a deadly game that put what was left at risk. Who he thought he was, his place in the scheme of things, will be challenged by a killer who stalks and bides his time. Only Cavanaugh can stop the carnage, uncover the evil. But the price to pay may be innocence itself. "A roman à clef based on a lawyer's journal puts him in the cross hairs in this legal thriller…. (O'Neill) orchestrates his complicated, twisty plot toward an unexpected and satisfying conclusion…. A well-plotted and dense courtroom tale." (Kirkus Reviews).